Tarek Chemaly: Lectra uses reverse psychology in the best possible way! Lectra uses reverse psychology in the best possible way! When it comes to reverse psychology - Lectra does it masterfully. 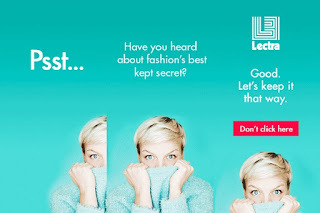 In a gif which I deconstructed the brand invites its target audience no to click on the link (which obviously they are going to) only to tease them before with "have you heard about fashion's best kept secret? Good. Let's keep it this way". Find the secret here!